In our quest to keep improving our diet, our family has markedly cut down the sugar we consume and I try to counsel my patients to do the same. But I believe it’s important to let children enjoy occasional sweets and teach them the skill of enjoying food in MODERATION. Healthy substitutions mean that we can still enjoy the occasional sweets and still reap some nutritional rewards, too. My friend Najla recently brought over an amazing chocolate coconut pie recipe from her favorite healthy dessert blog called “Chocolate-Covered Katie” which features healthier versions of desserts. My 6 year-old and I decided to try to make her Deep Dish Cookie Pie which is GLUTEN-FREE and VEGAN. I was a bit skeptical as the first ingredient is CHICKPEAS….strange! 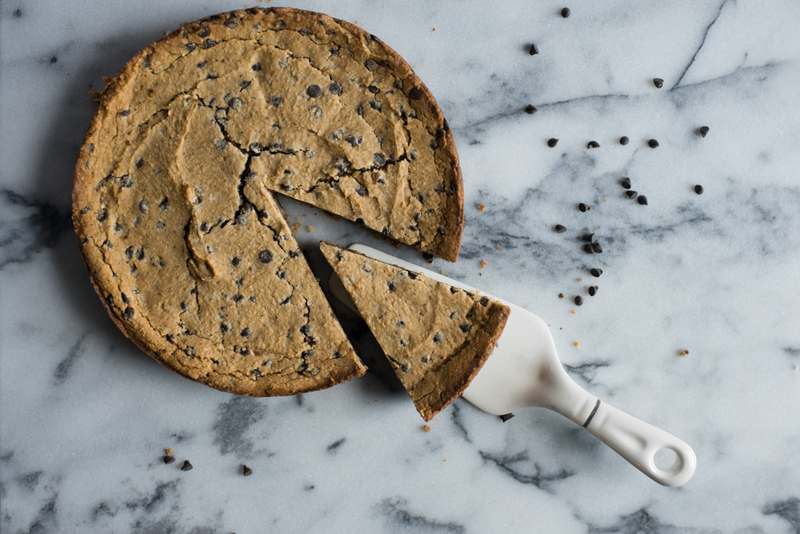 As we ran the ingredients through the food processor my 6 year-old kept saying, “I think there are too many chickpeas!” But we were shocked to taste the results -- a rich moist chocolate pie that tasted DECADENT! I took this to the Tiny Tasters and they all agreed this recipe is a WINNER. This is not low in sugar, but considering the healthy ingredients that are used and how little oil in this recipe, I would say it’s pretty genius (See the original recipe for a refined sugar-free version which uses dates and stevia). We will definitely be trying more of Chocolate Covered Katie’s recipes for our dessert cravings! Preheat oven to 350 degrees and oil a 13 x 9 pan. Combine all ingredients except chocolate chips in a food processor and process very well until you achieve a batter consistency (this took about a 60-90 seconds in my Kitchenaid food processor). Fold in chocolate chips. Spread batter in the pan and bake for 40 minutes. Cool 10 minutes and remove from the pan.